Although the island of Antigua greeted us with a hurricane upon our arrival, we immediately fell in love with its charm. While many of the countries that dot the map across the Caribbean are filled with that laid back island vibe, Antigua seemed to stand out from the crowd. It’s a small island of about 80,000 people and somewhat lesser known to tourists when compared to mainstream destinations like Jamaica and Puerto Rico. Head here to enjoy less crowded spaces and some of the most beautifully clear, warm, turquoise waters you will lay eyes on. The island is known for its beautiful beaches; all 365 of them! With plenty of options to choose from you don’t have to worry about overwhelming crowds as you soak up the sun. Antigua also boasts impressive shorelines where you can spot anything from the remains of historic sugar mills to natural geological formations of which the names are more akin to something from the underworld (like Hell’s Gate and Devil’s Bridge) than a paradise island. You’ll also catch glimpses of haunted resorts and massive mansions of the rich and famous! If jungle adventures are more your thing, head inland for exhilarating activities like ziplining where you can blast your way though the tropical canopy! St. John’s offers that special touch of city life that many crave, but the towns that cover the island all have a great deal of charm and warmth. 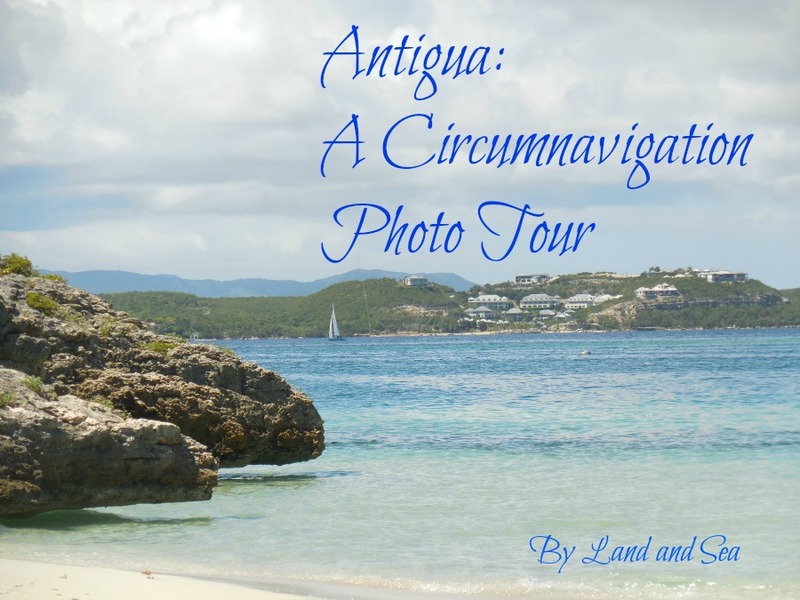 Because we wanted to see as much of this beautiful island as possible, we thought taking an extreme circumnavigation boat tour one day would be a perfect way to see what Antigua has to offer! First off, be sure not to confuse Antigua the island with Antigua, Guatemala! We easily fell in love with Antigua and were so glad we got to see so many different views of the island’s exterior. If you’re looking for a tropical paradise, plus some of the most spectacular sunsets we’ve ever seen, Antigua is the place for you! Are you interested in visiting Antigua? What is it about this laid back island that interests you?!? Share in the comments below! Antigua looks like such a beautiful, low key destination, and surprisingly not one we’ve heard much about! We plan to visit all the Caribbean islands though, so it’s definitely on our list (especially considering its many beaches)! That’s what makes Antigua great – so beautiful yet relatively unspoiled! The sunset looks surreal! We love off-beat destinations. Thanks for sharing. It’s such a beautiful place! One of our favorite islands! This would be a great place for you to visit then! It’s no secret, I absolutely love all things Caribbean! But, Antigua definitely stood out!! Antigua looks like a paradise island! What a magnificent sunset..! It’s one of the best islands we’ve been to! Antigua seems like paradise Jenn and I’m so glad the hurricane didn’t prevent you from getting there. Love that sunset pic, that colour wow! I haven’t seen many Caribbean islands but would love to when I get the chance and I think Antigua is worth putting near the top of my list. We loved it there and I’m sure you will too!! You’ll have to let us know if your travels take you to Antigua one day! Yes, it truly offers something for everyone! Thanks for commenting and sharing! Those wonderful beaches look amazing! So sad to hear about the hurricane, I am glad to you managed to make it there safe and sound. Great sunset photo, the colours are just amazing! This place looks amazing. I love the harbor and the secluded beach – hope one day I will get here and experience this for myself. The hurricane seems scary, glad you make it there safe. The sunset photo is my favorite, there is nothing more calming than watching a beautiful sunset. Yes, the hurricane was scary! But, we had a great time there – it’s an absolutely beautiful island! These pictures are so epic! love it. The first line about the hurricane made me laugh so much – great way to start a trip! Not. We have some rotten luck on some of our trips, hurricanes and all! Wow , Antigua looks beautiful and the views are just stunning! Awesome photos and sounds like you guys have had a super cool experience! Love all the quiet beaches! How cool is Antigua? Its actually place that’s been on my bucket list for a while. I love visiting islands and off the beaten track locations. We stayed in Antigua for a week for our honeymoon. I couldn’t believe how turquoise the waters are. Absolutely loved the laid-back vibe. Want to go back soon! A little piece of paradise for sure. Looks beautiful! It’s amazing how different the islands can be and each has it’s own personality. Glad you overcame the hurricane and had a nice time anyway. Another beautiful part of the world I’m yet to encounter. I can see myself in on of the coloured houses on the hill with the stunning balconies over looking the view! I haven’t heard of Antigua in the longest time, thanks for putting it back on my radar! Which company did you use for the high speed boat tour? We booked through Island Routes! Finally someone else who has been to Antigua!! Such a great island! Looks like a lovely place to visit! I am not at all familiar with any of the Caribbean so it’s great to find out! The Caribbean is a favorite travel destination of ours! Wow – I can see why you fell in love with Antigua! We have never been, so we really appreciate the photos. In fact, it’s been ages since we were in the Caribbean, so this post has Antigua calling our name! It is one of our favorite places for sure – so incredibly beautiful! You’ll love it when you get there!